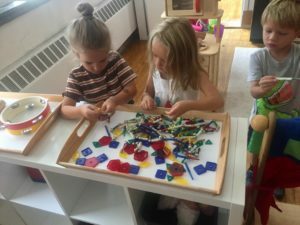 A new, nonprofit primary school (K-5) serving Bloomington-Normal with an innovative, project-based, community-resourced approach to education, Bloom Community School opened in June 2017 with summer programs and launched its inaugural academic year in August. Dr. Laura Kalmes is president of the Bloom Community School Board of Directors and the educational leader who saw a need – and possibility – for building a school learning environment that would nimbly utilize best practices in education for preparing students for the challenges of the 21st century and uniquely connect with McLean County resources. “Bloom connects student interests to academic inquiry and community resources,” said Kalmes, who, along with a daily-engaged group of board members has invested hundreds and hundreds of hours in the past year in starting this pioneering school that serves families and the community with its research-based, wholistic approach to learning. Bloom’s classrooms and school day look quite different than other schools. In every room, a soft-sided peace tent invites calm, and work tables might hold a chess game, blueprints of the building in which their classrooms are located, a structure made of popsicle sticks, and a pile of sticky salt dough. A math lesson might be embedded in creating a meal budget, or literacy instruction might take place on the bus. For these students, discovering what they want to learn and how to learn it is part of every investigation, with the broader McLean County area as their extended classroom. Bloom students are engaged in activities that research shows are important for all growing minds: plenty of outdoor play, reading, individual and collaborative inquiry, games, and imaginative play. Teachers draw on student interest to help direct short- and long-term projects that incorporate literacy, math, science, social studies and the arts. With small class sizes, teachers individuate instruction and guided learning to meet the needs of each student, and also engage in ongoing assessment. Each of the classrooms – Pod, Sprout and Blossom – plan community trips, welcome guests, and help students do research and skill-building to delve deeper into meaningful projects. A week’s schedule might find Bloom students and teachers measuring hallways, visiting the Refuge Food Forest, cooking applesauce, bringing science experiments from home, following a bus route, painting a map, digging potatoes, creating a meal menu, playing board games with younger schoolmates, writing a script and making characters for a puppet show, calculating cost-per-unit of play-doh and enjoying a weekly public library visit. “The idea of forming a school community is interwoven through social and academic learning activities in each classroom, through literacy work, in navigating our towns on foot and on Connect Transit, through shared outdoor time on the playground and indoor or picnic lunches, and Friday game time,” said Rachel Lapp Whitt, a Bloom board member who joined Kalmes, Paul Finch, Karin McDowell and Grace Sheese on the initial start-up team that initiated the Bloom summer programs. The board now also includes Stefen Robinson and Ky Ajayi. 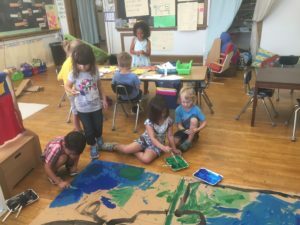 “Our creative teachers have set up projects around map-making, community services, playing together, feeding community, and more – all while encouraging the skills that children need to be curious learners and helpful collaborators,” Lapp Whitt continued. Bloom Community School also operates a lively before- and after-school program, Blooming Minds. 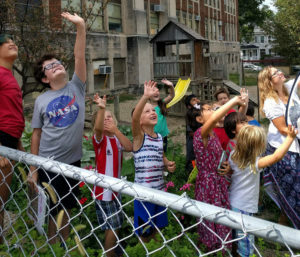 Students from public schools in Bloomington and Normal join Bloom friends for reading time, student-led projects, outdoor and indoor play, games, and more, led by Alexis Astorina. A recent interest from students in building rafts and boats led to creation of an outdoor water exploration to test floatability. “Drawing out and building on student interests and inquiry is an important part of our work, which extends into all of our programming,” said Kalmes. Bloom will contribute to the broader community in a number of ways. The school is itself a unique educational choice for families –those whose financial realities allow them to pay full tuition, as well as those who want their child to attend Bloom but may face financial obstacles. Bloom leadership felt strongly about creating a tiered tuition program called Bloom Connections, which offers full and half-tuition payment programs by application. The school also connects families with community partners who welcome Bloom students to their organizations or businesses to benefit from feedback about their educational programming. The symbiotic benefits are exciting, Kalmes said. Helping the board and teachers create this unique environment and build constructivist practices in classrooms is an Educational Collaborative group, which includes weekly involvement of Dr. Deborah McPhee, director of the Borg Center for Reading and Literacy at ISU, and doctoral candidate and former teacher and principal Jill Donnel. Kalmes has also engaged science, arts, language and library collaborators who are contributing to Bloom’s development. View more about Bloom Community School. If you would like to help Bloom Community School meet its goals and donate online, please click on the Donate button below. If you prefer to make a donation in another manner, click here for information.